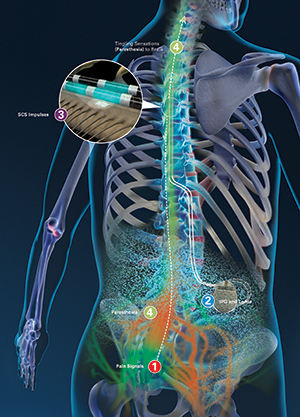 Spinal stimulators are implantable devices designed to administer pain medication. These devices deliver medication directly to the source of your pain and block pain signals sent from the spinal cord to the brain. This is the latest technology for spinal pain management, and the results these devices achieve are nothing short of remarkable. Send low levels of electrical current to the spinal cord to block pain sensations. Prevent the spine from sending pain signals to the brain, thus blocking the feeling of pain. 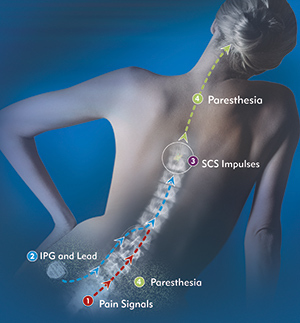 At The Spine Center, we're committed to using the latest technology available to treat your spinal pain. Doctor Saqib Siddiqui is an expert in minimally-invasive surgical spine solutions. If you're suffering from chronic back pain, Doctor Saqib Siddiqui can implant a pain management device to help you enjoy a better quality of life. Visiting The Spine Center is unlike going to any other back surgeon. The only way to determine if you're a candidate for these pain management devices is to schedule a consultation at The Spine Center. Let Doctor Saqib Siddiqui and The Spine Center discover the source of your spinal pain and provide treatment options for reducing your pain. Call (954) 916-7062 or reach us online to schedule your appointment today!